So I had the idea this year to do a series on the blog of Games We Love, and why we love them. If you aren’t a game player, you can skip these posts because I warn you, they will be PASSIONATE and full of detail, a LOT of detail. Maybe I’ll even get tired of them myself, but for now, I’m going to give it a spin and see how it goes. It was almost impossible to pick just one game to feature first, but in case I run out of steam on this little project I thought I’d start with our absolute most favourites and work our way down. 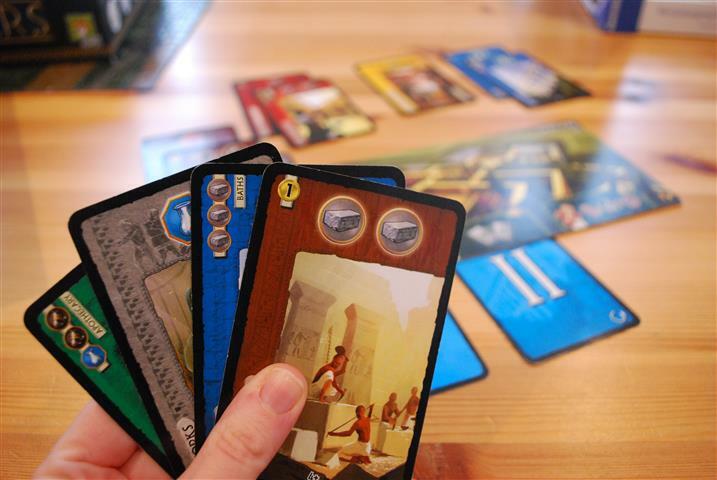 So top of the heap comes first: 7 Wonders. The box says ages 10 and up, but our youngest, at age 7 and a half, can play on her own and actually has even won a few times (she watched us a lot first, then played “on a team” for a while before going out on her own). Our middle kid has been playing since just before she turned 9 with no trouble. You can play with two through seven players, which makes it a great choice for bigger families (we have SO MANY games that are just for four players, GAH). Playing with just two players is a little more complex – you have to take turns being the ghost “third” player – so I would recommend starting off with at least three players if you can. 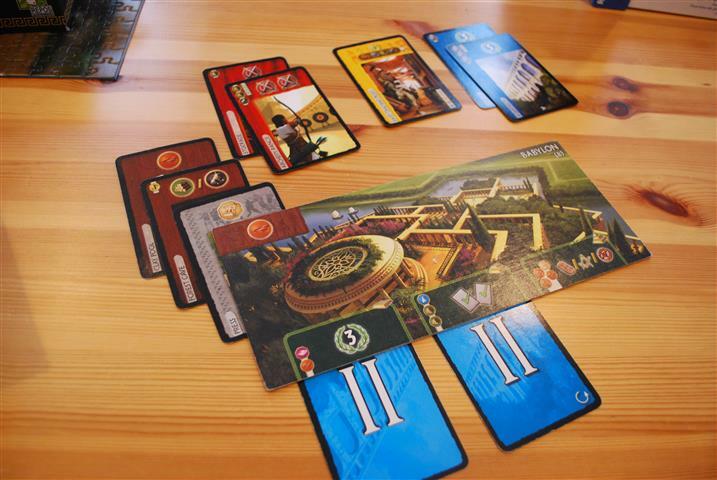 7 Wonders is a game with a TON of rules, as well as dozens of different cards, and when you first get it out of the box it’s overwhelming. But it’s acutally really simple once you get going – after just one game you will get the hang of things. If you can, try learning from someone who already knows how, and don’t let them overwhelm you with rules – just get the general idea and then jump in and give it a try. 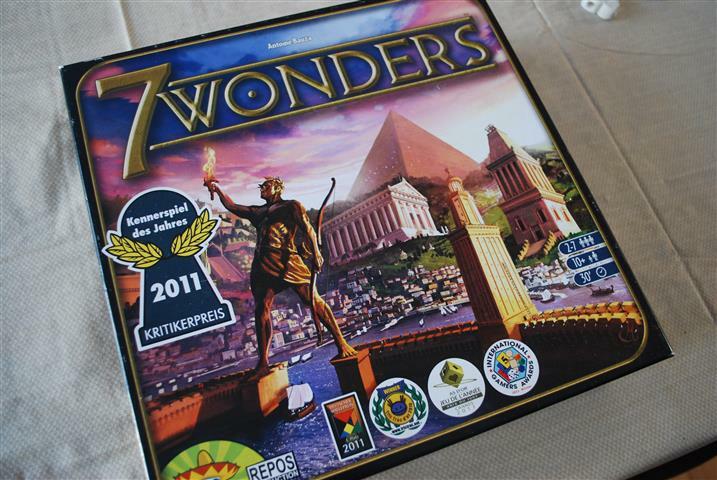 The game is based around the 7 wonders of the ancient world (educational!). Every player gets their own personal board featuring one of the 7 wonders, and some special powers in the game that come along with that. You’ll be collecting cards during the game, and using some of those cards to “build your wonders” – claim your special powers on your board. The other cards you’ll be collecting go face up in front of you and represent points (which are what actually help you win the game), and resources that allow you to buy other cards that are worth more points. The point-collecting cards work in a variety of ways – some of them, you have to collect a set for it to be worth anything, others you have to have the most of that type to get the points, others are not worth much now but will give you a free card later on that that’s worth more. You have to decide which kinds of cards are going to be your best strategy for this particular game. Collecting the cards is the best part. Each player starts with a hand of seven cards, then you pick one to keep, and pass the rest to the player beside you. Then everyone plays the one card they chose face up, picks up the hand of (now) six cards that was passed to them, keeps one, passes the (now five) hand away, and so on, until all the cards are distributed. Once you’re down to a two-card hand passed to you, you keep one and discard the other, so every player gets a total of six cards throughout the round this way. Points are semi-tallied and then there’s a new set of seven cards dealt out (keeping all the cards you already have), with three total rounds before the end of the game. One of the great things about 7 Wonders is that it’s simple enough to learn to play quickly, but because everyone gets a different board each time, the strategy changes each time. Your own board will guide you towards a specific strategy due to the special powers on it, but what the other players are doing matters too, and you have to adapt to the table as it lays out. The kids are okay at this – the girls tend to have a favourite strategy and stick to it, which sometimes works, sometimes not. We offer lots of advice and try to point out when they are collecting too much of one type of card (for example). For us adults and the Captain, it keeps things interesting and we’re always having to think about things, rather than play on autopilot. Another thing we love about this game is that it’s really hard to guess who is going to win, or even who is in the lead, during the game. That takes away the “I’ve lost already, I can tell, yet I still have to finish this stupid game” feeling that comes from other games (like, say, Monopoly). Sometimes we have been really surprised at the winner, and the kids in particular are always willing to play because they feel like they actually have a chance at winning (and they do – I’d say it’s about 50-50 whether one of the kids is going to win, or Sir Monkeypants or I are going to win). At the end of the game, you have to tally up the points in front of each player and I highly recommend purchasing the 7 Wonders app for this purpose. It’s a 3rd party app but the one we have is really professional and stable, and supports all the expansion packs too (if you get really into it). Plus, as a bonus, it keeps stats on each player – so you can see how many games you’ve ever won, what your winningest strategies were, what your winningest boards were, that sort of thing. The kids LOVE this, and there is always a fight over who is going to get to “do the iPad”, and then after every game they have to study their stats extensively. As I mentioned, there are a ton of rules and cards so it can be a little tough to get going the first time – but stick with it! There’s a bit of complicated setup – you have to sort the cards by the number of people playing, and only use the marked subset of cards that matches how many people are playing. There’s also some special cards (“guilds”) in the third round, and a somewhat complicated procedure for picking these at random to add to the third-round deck, again based on the number of people playing. That’s why it’s awesome if you can play for the first time with people who know what they’re doing – they can do all the setup for you, and you can just focus on the basics until you’re ready to fly free, little birdies (thanks to Tudor for reminding me about this one!). This game was our absolute OBSESSION in the summer of 2013 – we even took it with us to PEI and played every night in the hotels and cottages we stayed at along the way. Since it’s a strategy based game, not a party game, it’s for families that really love gaming – if you’re looking to graduate up from Monopoly or Game of Life or Clue, this is a great first step into a larger world. So funny! We got 7 Wonders for Christmas and my husband and younger son HATE it with a passion. That tough first time set-up completely turned them off. I keep telling them it’s not that different from Ticket to Ride (which we all love) but they won’t believe me. We do like Ticket to Ride, and Carcassone – those more strategic, non-dice games, but hands-down, two big winners that anyone can join in anytime, and require essentially zero coaching to get up to speed are Apples to Apples and Scattergories. It can be the four of us one night, my parents can join in another night … they’re easy, easy, easy, and fun! My sons go to Games Club at school – starts at 3:40 ends well after 6:00 and involves playing games in the library with pizza for dinner. They LOVE it and we get endless game recommendations coming home. I just realized I didn’t mention any of the drawbacks of the game…I think I will actually go back and add that category. Ticket to Ride is definitely on my list for an upcoming post. I have heard good things about Apples to Apples but we don’t own that one – it’s on my list for next Christmas! oooh, i’m going to like these posts! I agree with games that are more number specific. we bought Pictionary and then realised you can’t play it with only three people. 😦 looking forward to the next post!